Veuve Clicquot’s Manhattan Polo Classic on Governors Island was the first polo match in Manhattan in over 70 years. The event paired Black Watch against Asprey London and was free to watch. The match was played three on three and was four chukkas in duration. Johnny Midwest and I made it in time to see the last two chukkas and were the only ones (of the bike polo crowd) who made it to the polo field, although others tried but couldn’t due to weather. We were both very impressed to see the sport first hand, and we had a conversation with another spectator named Akshay (unsure of spelling) who was filling us in on some of the sports details such as the worlds best polo player, Nacho Figueiras, was on the field playing for Black Watch, and some interesting details about the horses. And we might have found a new bike polo player too. Mauricio Devrient playing for Asprey London. 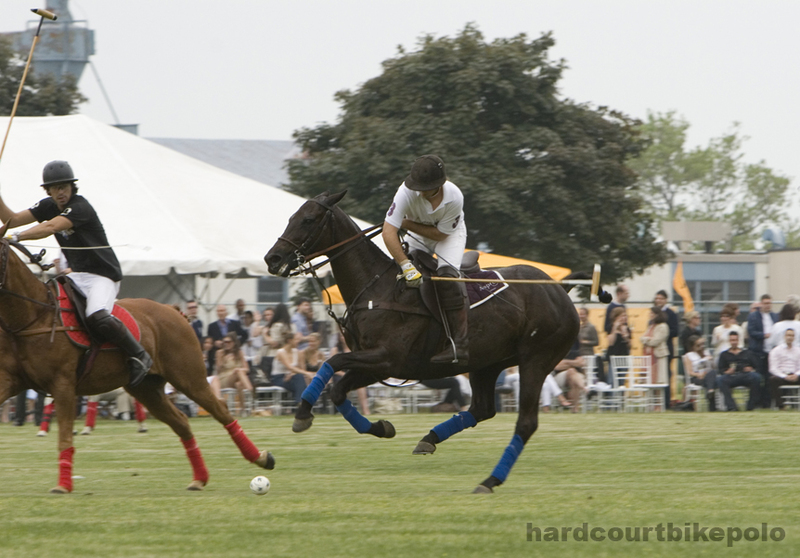 This entry was posted by Doug D on June 1, 2008 at 1:37 am, and is filled under Events-Past, Just One, New York, Off Topic, Past Polo Events, Photos, Races, Events, & Other. Follow any responses to this post through RSS 2.0. Both comments and pings are currently closed. Awesome. Wish i could have joined. I’d love to play horse polo too! Then, i might actually be good at it. I really don’t have any other info besides what you see. I’ll assume the Games’ they are referring to was the 1908 London Olympic demonstration matches. If so, then this would be Ireland. Caught this on the forums. Clearly worth the repost.